Stabling for the Mini Event, Hunter Paces, Clinics and Schooling Days is available at the National Equestrian Center (NEC), located in Lake St. Louis, just a ½ hour drive from Queeny Park on I−40/64 (directions from Queeny Park to the NEC available here). The NEC is a premier show facility with overnight stabling and RV hookup available. To request stabling, contact the NEC here or please call 636-561-8080. Saturday March 2, 2019 Trivia Night Extravaganza 2019 Trivia Night Extravaganza! DON'T FORGET!! THE QPEE CROSS-COUNTRY COURSE CLOSES TO ALL PARTICIPANTS ON MAY 12, 2019 at 6:30 pm. 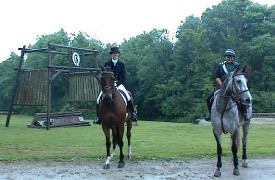 This is in order to prepare the jumps and footing for the trials and is also following the rules of Horse Trials set by the USEF. Failure to comply will result in elimination!